So much for the “migrants are more qualified than the Australian born population” argument, which surely needs to be put to rest. In relation to the thumbnail graphic you have used for this article (yellow Melbourne taxi) my anecdata l shows that there are now HEAPS of old white guys driving taxis (compared to a a year ago and earlier when there were basically none, and lots of young foreign guys). I think it’s the taxi plate owners doing the driving now. Attribute it to the taxi license reforms in Victoria which have made plates cost like $100 (or less?! – http://taxi.vic.gov.au/drivers/fees-and-charges !) and have therefore put an end to the ability of the old white guys to sit on their a$$es, employ foreign slave (“skilled”) labour and just collect the rent flowing from government regulation. love it. Uber kicked the process off, of course. Haven’t been in a Melb taxi for a long while. Am using the cheaper alternative. I hope you are right. Will be good to talk to a taxi driver who is from here. Taxi licences were pure economic rent – now being erased. I noticed, all those foreign slaves (skilled labor) now drive Uber. If locals are driving taxi’s now I might support them. Or maybe not – an outsourced PR-spin company is just as good. Two anecdotes to feed in on this. A mate who vets people for security purposes tells me that apparently there are a record number of people applying to join the military with Masters degrees in IT related fields – because they cant use their skills in any workplace or keep them up to date otherwise. All those SJW’s saying that we are offering these skilled migrants a better life are amongst the biggest hypocrites in the world. These are the same moralising do-gooders, who would be outraged at the thought of Australia going to these developing nations and strip mining them of their Gold, their Oil and their Timber. Yet our immigration policies are effectively strip mining these nations of their soft & intellectual capital and as effectively as if we were stealing their diamonds. Undoubtedly these same moralising bastards will turn around in 5 years time and ponder WHY these nations are failing to develop, without giving a single thought to the fact that its because we have been stealing their best and brightest and their agents of social change, and giving them underpaid jobs to deliver pizza. When they inevitably blame the west for the predicament of their favorite pet nation failing to develop, do you know what – they’ll be absolutely 100% correct… only it will be because of these Moralising HIGH immigration advocates, not because of evil racist westerners. Short sighted do gooders build the best highways to hell. >Short sighted do gooders build the best highways tollways to hell. Fixed that for you! Get it right next time, buddy! Your analogy is broken because those people aren’t being taken, they are leaving. The only thing that is broken is your value set. The only reason they have anywhere to leave to, is because our corrupt elites have thrown open our doors, without ANY regard to the impact it has on the less well off and the vulnerable in OUR society and even less regard for the destabilising effect of stealing another nations social capital and investment in their own peoples training and education. You seem to think I support high levels of immigration. I am just pointing out your analogy is stupid. It has nothing to do with “moralising”. My analogy is spot on, when you look at it from the perspective of society as opposed to the Boomer mindset of viewing the world through the lens of individualism. A lot of overseas IT workers have a suspiciously large number of qualifications. We quickly filter out the fraudsters with technical questions or tests, but it is frustrating that recruiting companies don’t do this first. Yep. Spot on. Majority are totaly fraudulent in qualifications. Those that have actual qualifications think they are senior level IT wizards but struggle to best a first year uni student. Know a 100% indian support team flown in an 457 after a local contractor team was replaced. Thier support methodology consists of emailing everyone asking if anyone knows how to fix this. I worked a contract for Virgin Australia a while back. Though they have some good people they use Bombay for a lot of product support. I was charged with finding the original source of the data for a part of their airline reservation system. At one point I had to ring India as they were responsible for the doco. I verbally agreed a detailed list of what I wanted. I got back an SQL statement……… “Select A,B,C from Database”. They didn’t even understand the concept of “original source of the data”. Having said that, I do know of some good Indian guys working in Brisbane. The problem is that, in an era where government of all colors supports the suppression of Australian jobs in favor of cheap 457 labor and Bombay “software houses” , there is no vetting process. The only so called skilled immigrant IT workers I meet are the ones delivering my uber eats lunches. Angry man, what about driving your taxi home too? Agree about the support issues. Basically ‘skilled’ visitor/457 IT expect documentation so granular it tells them everything except when to breathe. The is a huge industry minting money off bringing in “skilled” migrants. This is how CPA made their millions, verifying accounting qualifications. EA (Engineers Australia) does the same thing for IT and engineers. Immigration agents are also minting it – my company employs them the handle the importation of 457 holders. When a local resigns, we just replace him with a 457 holder or two. The immigration agent handles all the paperwork “proving’ that we couldn’t attract a suitable local. So for each immigrant there is around $4000 for the agent, $3000 for EA to “vet” their qualifications and $3000 to the Immigration dept. All these fees can now be deducted from the immigrant’s wages. Immigration agents can do everything themselves, too, charging the poor immigrant $20,000 and finding a shell company to offer them a “job”. The whole thing is corrupt, but there’s lots of $ in it for agents many of whom are ex-government immigration officials themselves. Really interesting OxTa, can you give more examples, you should contact a tv station if possible to expose this corruption. Moar cooks, hairdressers cafe and restaurant managers and transport company managers from India! If you took these 4 off the CSOL you would wipeout literally 50% of the 457 program. I do wonder just how much of an immigration problem we’d have if skilled immigration was actually being used as (ostensibly) intended and student immigration required attendance at respected institutions with passing grades. Such changes would also be reasonably impervious to any (credible) claims of racism, as well. FWIW I know a former theater nurse who last we caught up was working in a cafe. Married and citizen now. Great couple. So, of the 210,000 permanent migration program, 130,000 are “skilled” and 80,000 are unskilled, right? No, not right. A large chunk of the 130,000 “skilled” are not skilled at all. The skill stream has a significant family component. 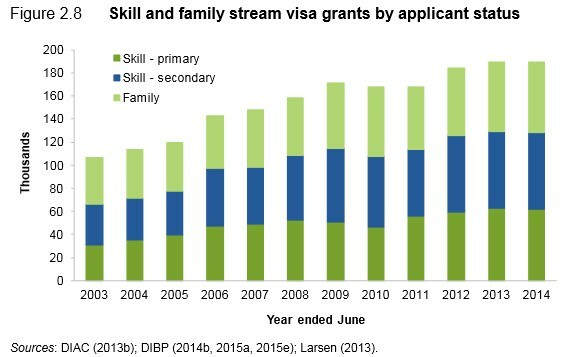 Over half of all skill stream visas are issued to secondary applicants – partners and dependant children. The ONLY requirement for such secondary applicants is that they pass the age, health and character requirements. The age cut of is 50, btw. So… the 65,000 balance must be skilled and have relevant experience in the field for which they hold qualifications? Again, no. Many of the 65,000 are graduates from universities (both within Australia and overseas) with little work experience. 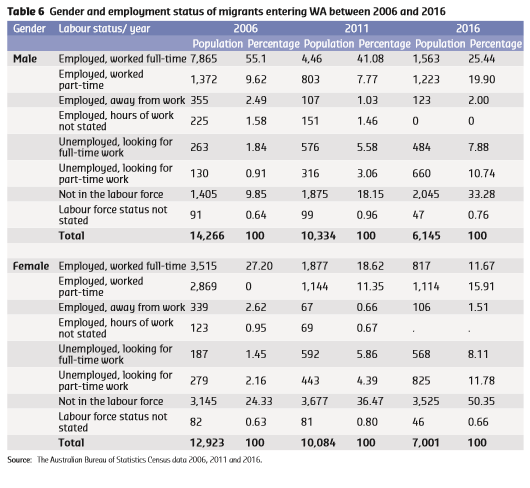 The majority of the 130,000 “skilled” migrants qualify for permanent residence under the points system, rather than being directly nominated by an Australian employer for a job vacancy. 60 points are required. They get 30 automatically if aged 25-32, ten points if “proficient” in english, 15 points if they have a Batchelor level degree, etc. Then, hey presto, you have permanent residence! I urge people to read the Productivity Commission’s report to Parliament last year: “Migrant intake into Australia 2016”. The report was highly critical of many aspects of our permanent migration program. Good analysis, however why is then the jobs market saturated with immigrants? Just try and find an IT job in Sydney without competing against a horde of cheap imports first. Is it simply a case of there are no jobs and everyone is fighting over scraps? Skilled native-English-speaking migrant here. I took a pay cut of slightly more than 50% and a cut in responsibilities to migrate to Australia. I work in IT. Once I got my PR, it was back up to my usual rates. The company that originally employed me at such a discount? A local council in a pricey mining town in regional Australia who had a list of award rates for IT people that were below the cost of living there. No Australian was willing to stall their career by going out bush for a DISCOUNT over what they could make in Sydney, which at the time had housing prices about the same as that town’s, maybe a bit lower. But never worry, the place was full of 457s who, like me, “bought” their PR by working for below market rate that would have been accepted by Australian permanent residents and using their savings to survive, until they could get PR. @Jumping Jack Flash I know many older folks out of work, who previously worked in IT and would love to again… but companies all seem to have deals with Indian body shops. As someone who came in via the Skilled Migration Stream I can second this. No one here is interested in my skills, my (significant) qualifications and experience and I would even go as far as to say that I am generally considered a threat rather than an asset in the parochial, nepotist environment of the Australian job market. The whole situation forms a major part of our decision to head back (which is taking way too long to eventuate). 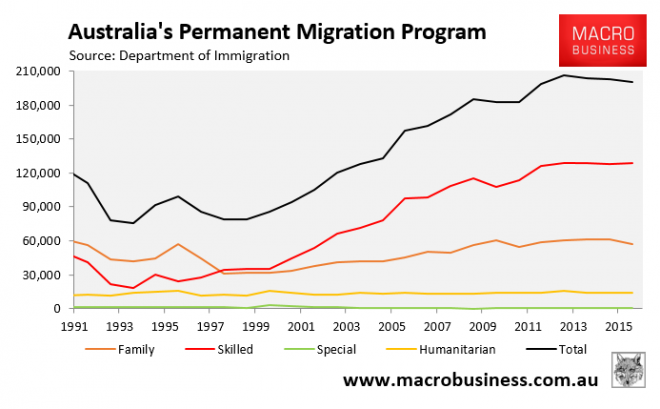 Anon, I get the sense the aus govt is running a bit of a ‘bait & switch’ con with its immigration program, proclaiming to any prospective migrant we a desperate for your skills, but the reality when they get here is quite different. I’ve seen it first hand with tradespeople coming from UK & Europe. Perfectly well qualified, but have to jump through a bunch of hoops like Trade Tests to get those skills actually recognized so they can get employment in their field. Don’t forget that there is a big industry built to fleece immigrants, by testing their skills etc. What industry are you in AnonNL? There are cases when the qualifications are fraudulent. I suspect we have only seen the tip of the iceberg any many cases go undetected. This guy was working in the system and hiding in plain sight for 10 years. 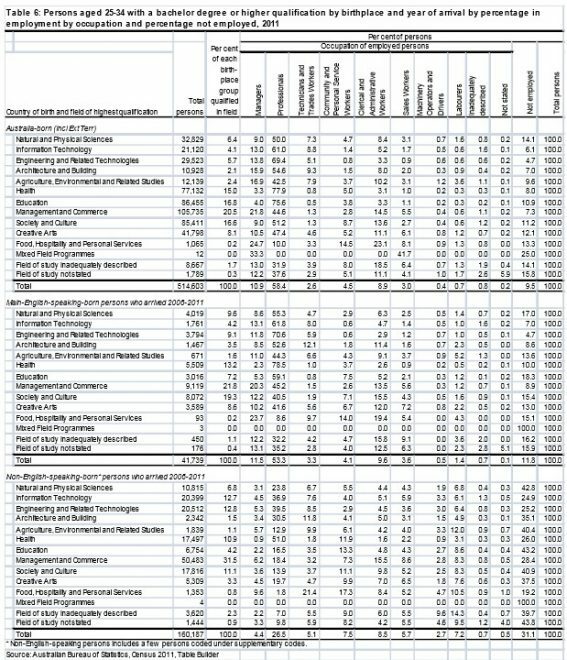 The Australian Bureau of Statistics (ABS) latest Characteristics of Recent Migrants report, released in June, revealed that migrants have generally worse labour market outcomes than the Australian born population, with recent migrants and temporary residents having an unemployment rate of 7.4% versus 5.4% for the Australian born population, and lower labour force participation (69.8%) than the Australian born population (70.2%). That can’t be right, that would mean our unemployment rate is going up. But if this is correct then this catastrophic. This indicates the population economic experiment has utterly failed and we are frankly doomed. whatever the problem is, it can always be fixed with some fast and loose statistics. Look no further than the shambolic CPI to see the power of statistics. To fix unemployment rises caused by unemployed immigrants they could simply stop counting visa’d immigrants in the unemployment stats or something. All due to racism of course. Surprise, surprise, said nobody, ever. As they scratch the surface they will find massive inconsistencies that can only make sense when the agenda is realised. Of course, the agenda is there for everyone with eyes to see, and with ears to hear. If they still trot out the tired old line that we have a critical skills shortage to justify such high levels of immigration, then surely a baseline study into professions, professional workers, and employment opportunities growth per profession is required to see how bad it is, how much adjustment needs to be made to rectify the problem, and, most importantly, when the problem has been rectified and the adjustments can stop. A study was certainly required before they started bringing in as many people that could be bothered to jump on a plane and come over here, with the lure of 1st world living conditions, plentiful jobs, and low population. But better late than never. Of course, migrants are working below their skill level – otherwise what is the point of them? This is how it works – An employer advertises a job asking for someone with a masters degree and 5 years of experience, salary of $40k a year. Surprise suprise, he doesnt get any Australian applicants. He then goes to the Govt and says “I advertised this job and couldnt get anyone, so I need to get an immigrant”. The Govt then puts the job on the skilled migrant list citing a “shortage” of qualified job seekers. And the employer gets to bring in as many cheap migrants as he can find. Of course, if he had advertised the job commensurate with the actual skill level needed to do the job, at a rate of pay commensurate with those skills (say a Bachelors degree, and 2 years of experience, and a salary of $80k) then he would have been inundated with Australian applicants. But that wouldnt save him labour costs.